The Stowaways aren’t like the other Weedle Mice. They are inventive and curious, they go on adventures, and they are much too clever for their own good. In fact, everyone knows that Grampa Stowaway was killed in a trap on one of his adventures. So, who would want to associate with a family like that? There’s something else about the Stowaways. They keep secrets. Rory has made friends with a bird, their natural enemy; and his twin brother Morgan dreams of sailing away. But Gran has the biggest secret of all—and Rory has discovered what it is. If Rory and Gran act on their suspicions, will they be heading for disaster? Or will it be the greatest Stowaway adventure of all? 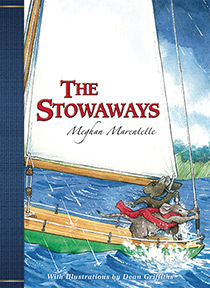 Award-winning illustrator Dean Griffiths’ nostalgic illustrations create instant charm, while Meghan Marentette’s warm, expressive storytelling transports readers to a world of acorn-cap lanterns and button-wheel bicycles where the adventures are enormous and the tiniest are the bravest of all. Published in Canada and the USA by Pajama Press, 2014. Available at all fine indiebound bookstores, and online at Amazon and Chapters/Indigo. Be one of my Tweople!